Spray Tan Solution 6%-16% DHA – 1000ml are for professionals by professionals. 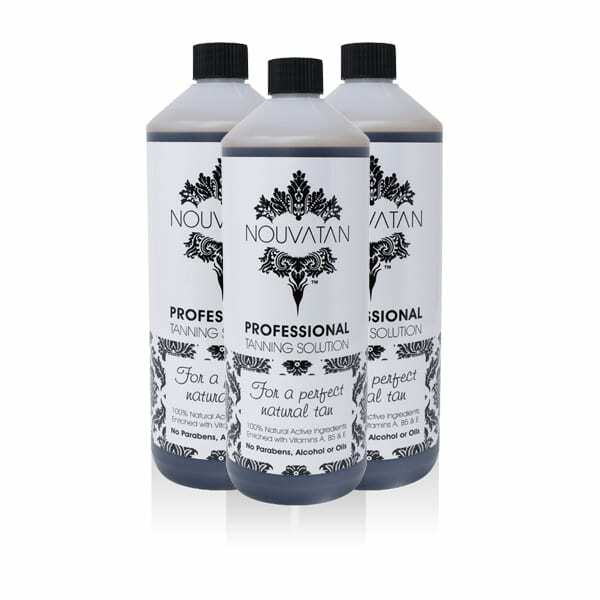 Nouvatan Spray Tanning Solutions contain Natural Active Organic Ingredients, with Organic DHA. It is enriched with Vitamins A, B5 & E. You will not find our product in the shops or supermarkets therefore, it is a salon brand. With a delicate fragrance of Mango and no Parabens, Alcohol or Oils, our spray tan solutions will leave your skin feeling nourished and with a perfect natural looking tan. We don’t have different names or fragrances so mixing solutions can be done to allow the user to tailor the shade. If you are buying more than one litre why not request a Trade Account? Our Spray Tan Solution 6%-16% DHA – 1000ml start from 6% DHA going all the way through our range up to Express Rapid tan “It’s About Time”20% DHA Rapid tan for darker, olive skin types. Rule of thumb is the lighter the skin you are working with the lower the %. Nouvatan 20% (Its about Time) is designed to be used as a rapid tan. Just shower off between 2 – 4 hours, or be brave and keep on for the full 8 hours. Amazing tanning solutions! Spray so easily and lasts for just over a week! I have had so many positive feedback from my clients and they all love Nouvatan. New to tanning, researched & tried different brands for 1 year. So pleased to be trained and now offer Nouvatan. Love how natural it is, such a gorgeous colour with no orange tone. Gd that you can mix solutions to get different DHA % & excellent customer service. Thank you. I absolutely love nouvatan, lovely colour and it smells so nice compared to other tans. Wouldn’t use any other tan now. I’m new to Nouvatan. I brought the 6%, 8% & 10% haven’t used the 10% yet but loving the 6% for my fair skin, first timers and the 8% is a gorgeous colour too. Very natural looking and no orange. Love Nouvatan. Fantastic product. Fantastic service too. Absolutely love this tan! After trying nearly every tan in the shops, and suffering reactions after a few of them, I’m so happy I found this solution. Doesn’t bring me out in any rashes even with my sensitive skin! I have now trained with Nouvatan and have only had positive feedback so far about how good it is! The team is fantastic, and the products not tested on animals. What more could you want?!!! I love using Nouvatan I think it’s the best. All clients rate it highly. It doesn’t streak, it doesn’t go orange, it smells nice. It wares off nicely l, very even. Over all 10 out of 10. Best product ever, clients love it, I love it. Would not use any other tanning product. Only ever have positive feed back on every spray. I use 6,8,10,12 % and express .Thank you Dawn and team ? Best solution ever! Great colour every time! I have been a professional tanner for 3 years and have tried and tested many of the top range tanning sprays,Nouvantan is by far the best product on the market and I absolutely love the shades. Love this product. My customers love the smell and tan. Wouldn’t use any other. So natural looking . Really pleased to have discovered Nouvatan, a client was wearing it and was so natural I thought she had actually been away so since then have used it on my clients. They love the colour, smell and the fact that they get at least a week and more usually 10 days wear out of it. Highly recommend. Amazing as always. Quick to dry, smells good, amazing coverage and colour plus the best wear off. Would never change. nouvatan is the best tan I’ve used. My clients are always happy with the colour. It dries fast and everyone comments on the delicious smell! Nouvatan solutions are fantastic. I use the whole range and find all my clients are always pleased with their tan . I find the solution to be of a good consistency and it is easy to apply. My best sellers are 8%, 12% and rapid express tan .